VertaseFLI was contracted by St Helens Council to undertake remediation works on a site in St Helens comprising 24No residential properties designated as ‘Contaminated Land’ under Part 2A of the Environmental Protection Act 1990. Site investigation works across the site had identified elevated concentrations of Arsenic, tars and galligu associated with the sites’ former industrial use, resulting in the risk of significant harm to the current site users. The remedial actions were required to facilitate the safe restoration of the gardens suitable for ongoing residential end use. 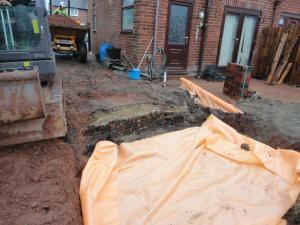 The works involved the excavation of garden areas to a depth of 600mm. Contaminated material was disposed offsite as either Hazardous or Non Hazardous to an appropriately licenced facility. Prior to reinstatement of clean materials an orange geotextile marker membrane was installed as a no dig layer. 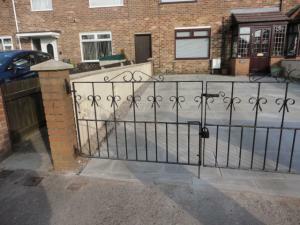 Gardens were then reinstated via the import of 600mm of clean fill, typically comprising 450mm of subsoil and 150mm of topsoil or appropriate surface finish such as Flags, gravel, turf or planting areas. All imported materials were tested at source in accordance with the specification prior to import, thus providing a pathway break. Other associated works involved the rebuilding of stone walls, brick outhouses, wooden sheds, pathway edgings and the preservation of existing live services.